I know some of you might be completely mortified by how much I've strayed from the traditional tiramisu here. 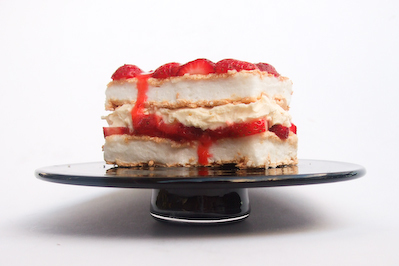 As soon as I saw what the challenge was going to be this month I thought about making a lovely traditional tiramisu (a dessert which I love), but I could make a regular old tiramisu any day of the year, and this was for Daring Bakers! I had to go a little crazy. I tossed up several ideas, but time and money constraints reined me in. 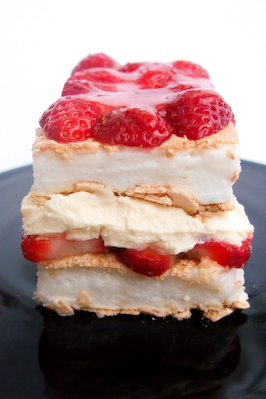 I thought about doing a dark chocolate and raspberry tiramisu with butterscotch schnapps, or a strawberry margarita tiramisu with lime juice and tequila soaked ladyfingers and strawberry mascarpone served in a cocktail glass with a sugar/salt crusted rim. But I was determined to get this dessert prepared for our annual family Chinese New Year's Ever dinner...and this recipe really does require a whole lot of prep. So I kept it simple. But tasty. 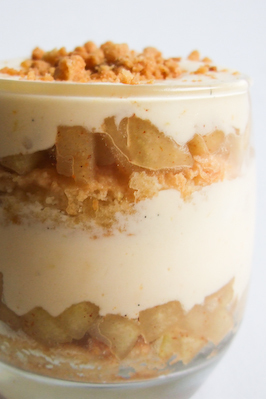 Apple pie and tiramisu, two favourites, two classics....together in one dessert, by using apples cooked until tender with butter, sugar & cinnamon, and a sprinkling of apple pie crust on top. And all of us were really surprised by how tasty it was in the end. I usually hate recipes that require this many separate elements and so much prep and chilling time. 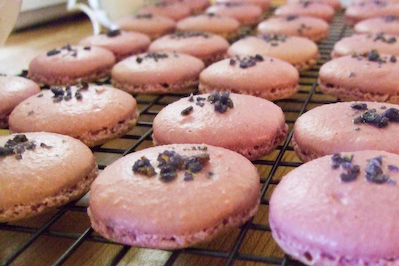 I like things you can bung in the oven once and be done with. It seemed like a huge shame to make this beautiful zabaglione and then mix it up with all these other creamy things so it was lost amongst it all. But then I made it, and it was soooooo good. For those of you who are tiramisu purists, I don't blame you. But try not to think of this adaptation as ruining a classic, and more that it is taking inspiration and creating something fun and new. 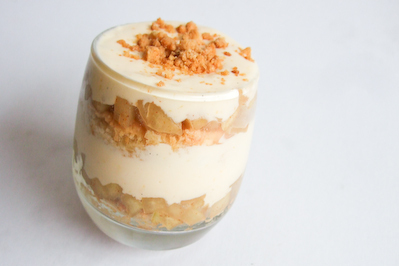 I really enjoyed the flavours and textures, with the soft, sweet ladyfingers that had the lovely scent of brandy, the beautifully smooth and creamy mixture, cinnamon flavoured apple pie mixture and the crunch of the crumble. 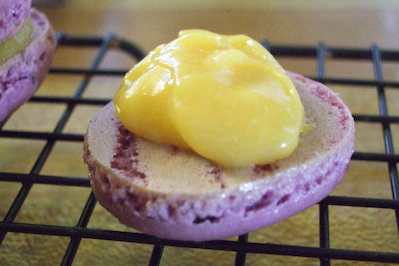 I might make this again, but hugely cut down the prep time by only using bought mascarpone and cream for the mixture and buying lady finger biscuits. 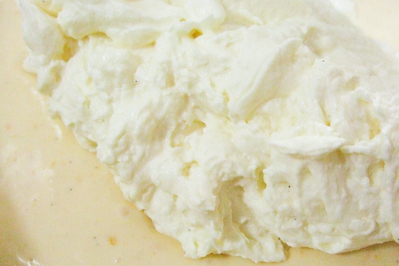 The mascarpone was easy to make, I've made ricotta before but the mascarpone was a little different. It only thickens when it curdles, so it's not completely obvious that anything has happened after you add the lemon juice. 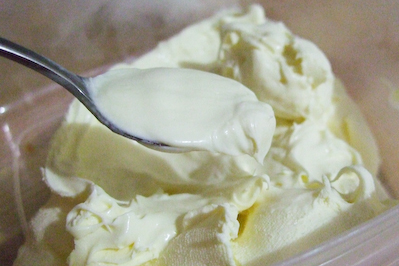 But after chilling it overnight it was lovely, creamy and smooth. 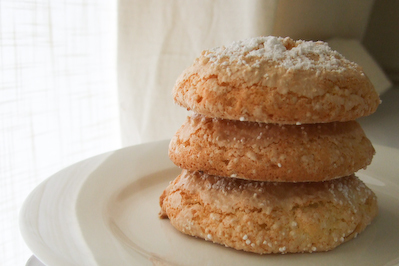 The sponge fingers turned out exactly like I imagined, soft and fluffy with a crisp outer layer. 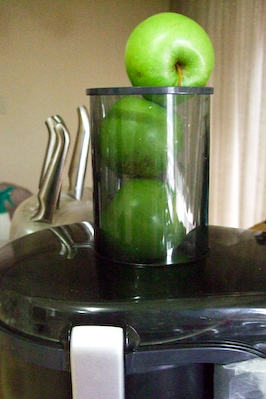 The apple pie filling and cinnamon crumble are dead easy to make, and I also used this as an opportunity to finally use our fancy fruit juicer that can take whole apples! 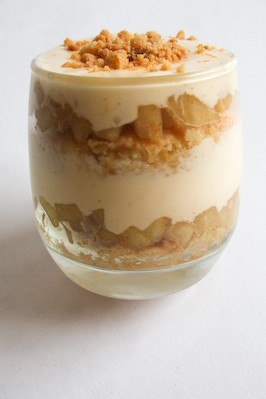 I made two versions of this dessert, as individual sized portions in these amazing glasses. A's Mum brought them back as a present from their trip to Thailand, they have pointy bottoms so they roll around like spinning tops, which looks cool but turned out to be a pain to keep still for photos, haha! I also made a larger one with the leftover ingredients in a loaf tin that was line with cling film so that I could lift it out after freezing it and slice up. 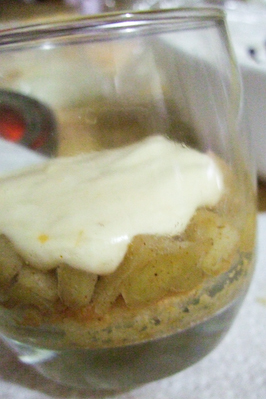 It froze beautifully and you could clearly see all the neat layers of sponge, apples and cream. 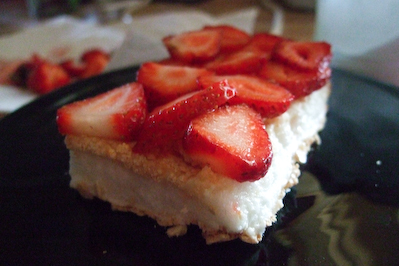 It even tasted great and was really smooth while it was still frozen, like a semifreddo. 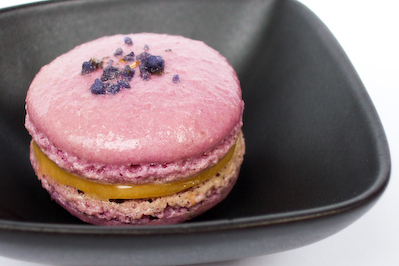 But I still preferred the individual portions the best, it was the easiest to eat and the prettiest to look at. And the perfect, light way to top off a very heavy meal. 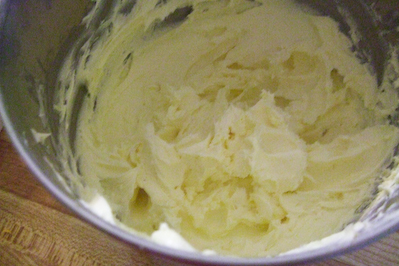 Preheat oven to 180 degrees C. Place butter, flour and sugar in a bowl and rub the mixture between your fingertips to combine them. 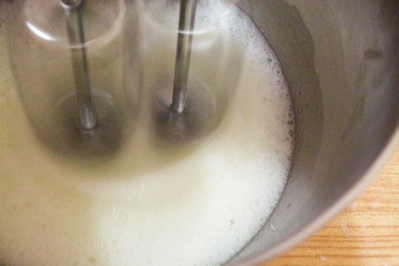 Lift the mixture up high with your hands and let it fall so it traps a bit of air. 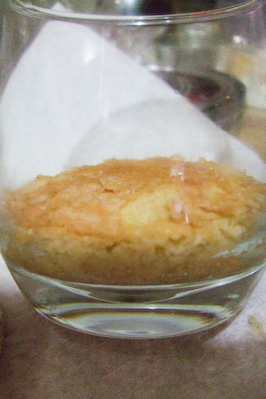 Add about 1/2 tsp of ground cinnamon, then gradually add a 1/2 tablespoon of water at a time, while still combining mixture with your fingertips until it starts to clump together in nice crumbly pieces. 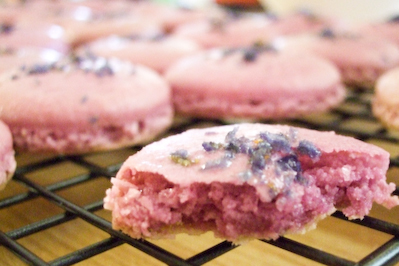 Spread in an even layer on a lined baking tray and bake until golden, fluffing regularly with a fork. 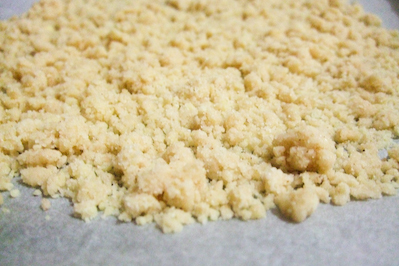 If the bits of crumble are stuck together after removing from the oven, allow to cool completely and then break up using your fingers. 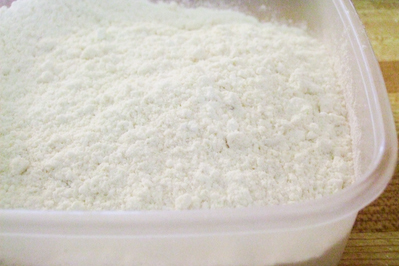 Can be stored in an air-tight container until ready to serve. Have ready a rectangular serving dish (about 8" by 8" should do) or one of your choice. I prefer using individual serving glasses. 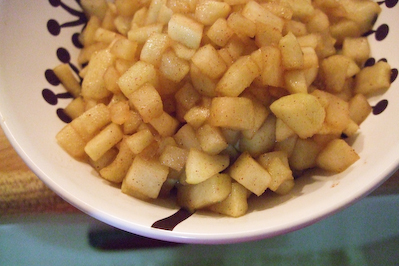 Mix together the apple juice and brandy in a shallow dish, whisking to mix well. Set aside to cool. Now to start assembling the tiramisu. I first used cookie cutters to give each of my round ladyfingers a neat edge, so that it fit well against the side of my serving glasses. Working quickly, dip 12 of the ladyfingers (or one disc at a time if making individual glasses) in the apple juice mixture, about 1 second per side. They should be moist but not soggy. 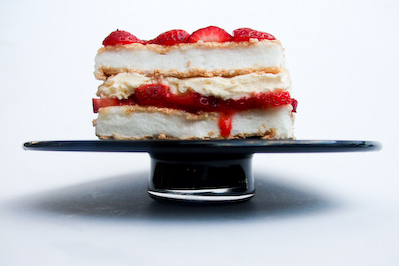 Immediately transfer each ladyfinger to the platter, placing them side by side in a single row. You may break a lady finger into two, if necessary, to ensure the base of your dish is completely covered. 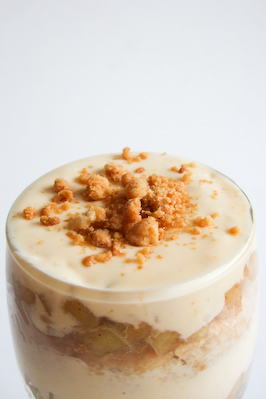 To serve, carefully remove the plastic wrap and sprinkle the tiramisu with cinnamon crumble. 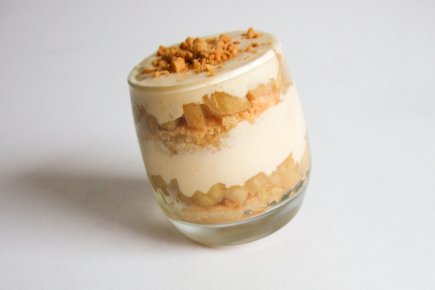 Cut into individual portions (or keep in individual glasses) and serve. 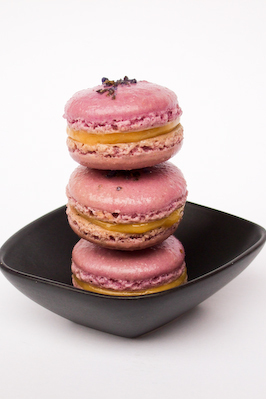 Many thanks to Aparna and Deeba for being lovely hosts this month and selecting an awesome challenge recipe! Summer is nearly over. And while I am looking forward to being able to snuggle up in bed on cool nights, to wearing tights and eating warm puddings, I'll still be sad to see the month draw to a close. 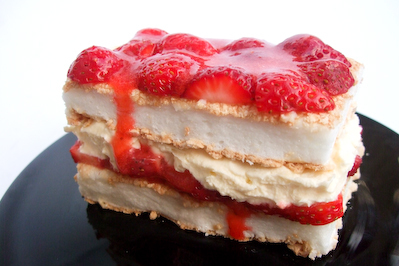 I'll especially miss all the summery desserts, chilled or packed full of summer berries. 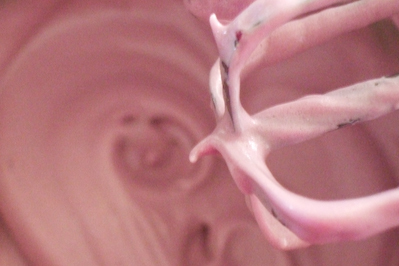 One of my favourite summer desserts is an Eton mess. For those who don't know, an Eton mess is a English dessert of strawberries, cream & meringue , traditionally served at Eton college . It's so simple and kind of ugly but it's just happiness in a bowl, that's why I love it. 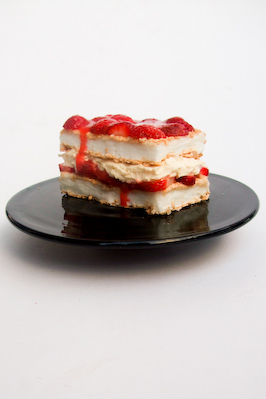 The combination of the sweet, crunchy meringue and the rich cream with a slightly tangy strawberry sauce and fresh strawberries, oh it's so good. 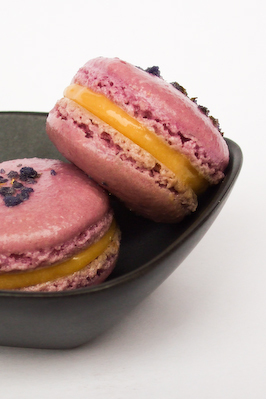 The dessert in these photos might look familiar to you. I'm fairly certain I was one of many people who spent the last month drooling at the sight of this beautiful peaches and cream meringue cake from Gourmet Traveller. It's just a total celebration of summer, and I wanted to make it really badly. The recipe is very straightforward as well. But then I had that craving for eton mess, and I had two punnets of very ripe strawberries sitting in my fridge that were begging to be eaten. I thought, why not combine the two and see what happens? 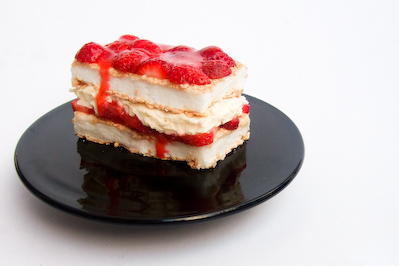 It would be like an eton mess...but not messy! And so the Eton Neat was born. Unfortunately, while concocting this idea in my head I forgot the fact that I am not neat. I am very, very messy. I am a proud slob. That's why the eton mess is so well suited to me. So as I attempted this recipe for the first time, rushing to finish it in the dying minutes of daylight after work, I made a total mess of it. And you can't call it an Eton neat if it's not even neat! I am definitely not up to Gourmet Traveller standards :( So I stuck the meringue back in the oven to harden up a little and made an Eton mess instead. I guess that means it wasn't a total failure, just remember you can make an Eton mess if you screw up your Eton neat, haha! And it still tastes so goood. But I rallied, determined to get this dessert to work. 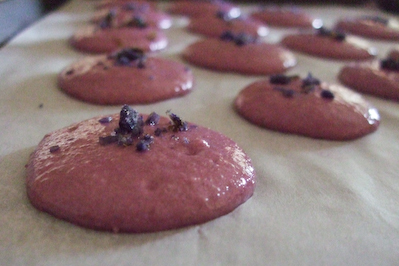 Now that I was more comfortable with the recipe, I tried again and this time managed to get it sort of neat. 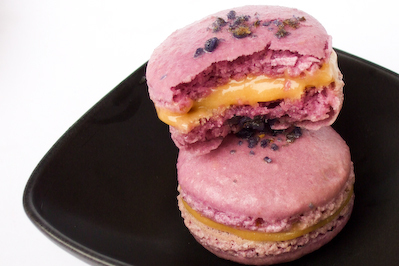 Even though it's not perfect, I think it's quite pretty anyway, and it tastes so good. 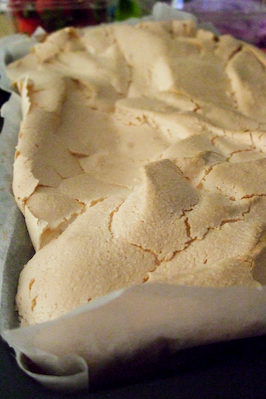 The meringue is fluffy with just enough of a crunchy outer layer to make the whole dish reminiscent of an Eton mess. 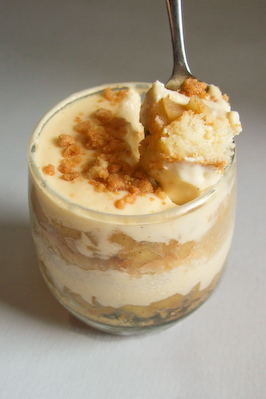 On my first attempt I also mixed some leftover mascarpone into the cream mixture and it added some extra decadence to the dessert, so keep that in mind as an alternative. But as long as you have some fresh, ripe strawberries, it will taste good no matter what. 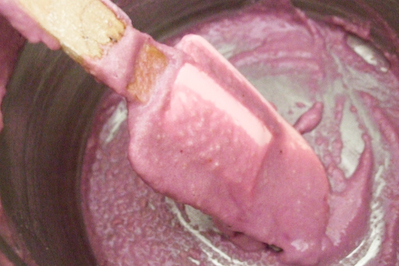 That strawberry sauce is lip-smackingingly good. 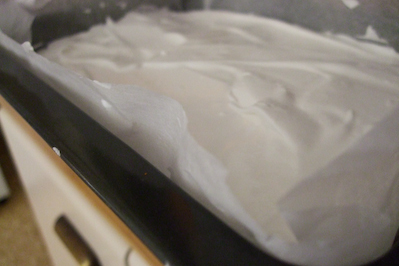 Preheat oven to 170 degrees C. Line a 28x18x3cm slice tin with baking paper and lightly grease with oil. 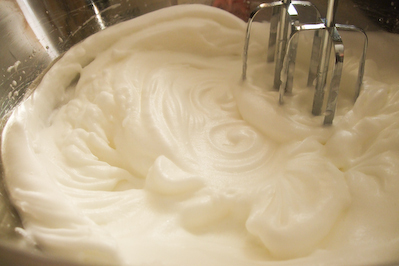 Whisk egg whites in a large mixing bowl with an electric beater until they form stiff peaks. 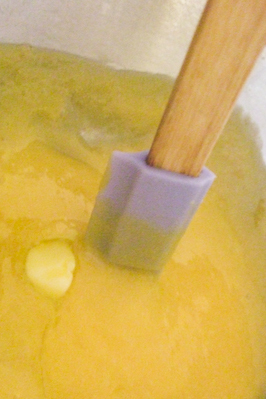 Gradually add caster sugar, whisking constantly, until the mixture is glossy. 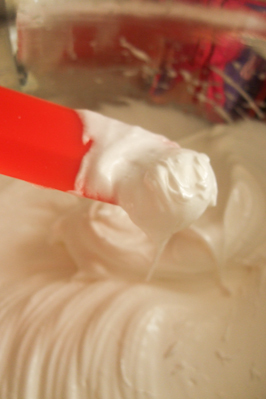 Gently fold in sifted cornflour and vinegar, then pour into lined tin and smooth surface with a spatula. 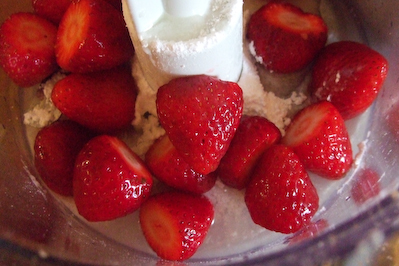 In the meantime, place strawberries, lemon juice and icing sugar in a food processor or plenty and pulse until smooth. 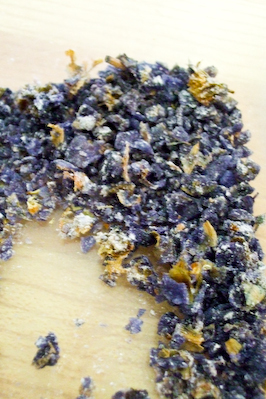 Strain to remove seeds and refrigerate until cake is ready to assemble. 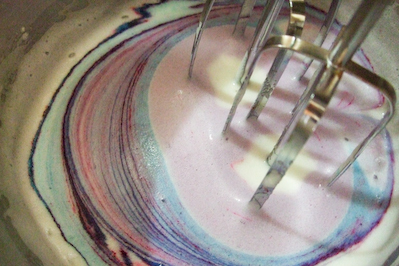 Whisk cream gently in a small mixing bowl until soft peaks form and refrigerate. 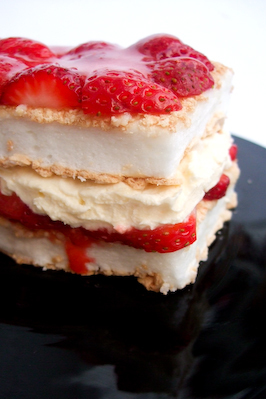 Place remaining slices of strawberry over the top of the meringue and then serve with strawberry sauce. Best eaten within 20 minutes of assembly. Serves 4. Happy Chinese New Year and Happy Valentine's Day Everybody! Wishing you a very prosperous new year and a lovey dovey Valentine's Day. Every year, even though our parents and all of our relatives are celebrating the new year in Malaysia, my brother and I will still try to whip up a fabulous new year for friends and loved ones. And the star of this meal is always the yee sang, an amazing sashimi salad which takes a fair amount of time and effort. 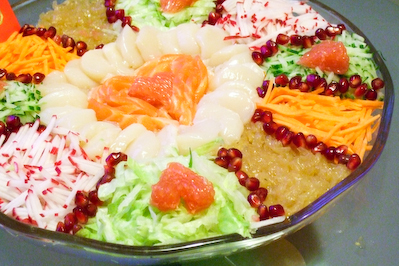 It's always my job to arrange all the different elements of our yee sang together on a big platter, and this year I decided to make it Valentine's Day themed. As you can see, there are a lot of things that go into this salad. 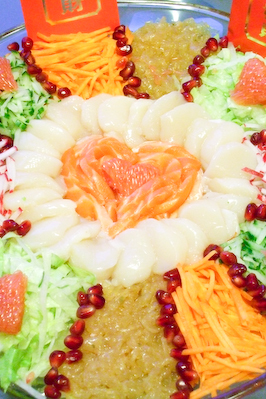 This year included plump scallop sashimi and salmon sashimi, radish, cucumber, lettuce, jellyfish, carrot, pomegranate and ruby grape fruit. 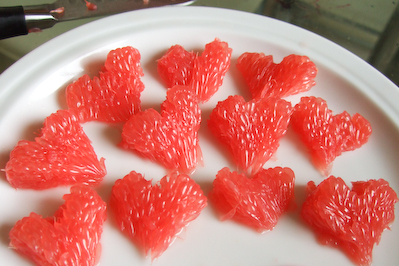 I arranged the sashimi in a heart shape and even carved the grapefruit. See? 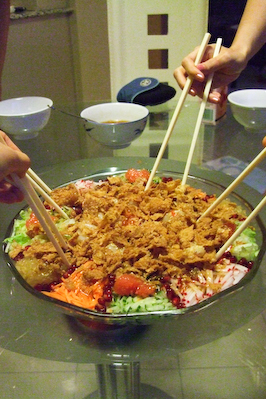 I used to think that everyone around the world had yee sang when they celebrated Chinese New Year, but quickly learnt that it's really only common in Malaysia and Singapore. So what's so great about this salad? Well what you see above is only half of it. The fun part is coming up next. 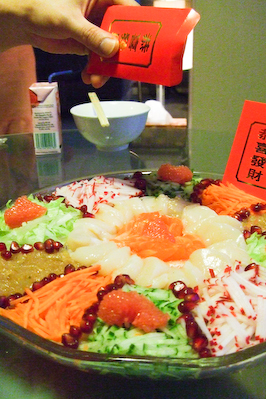 First we sprinkle the contents of our red packets over the top (toasted sesame seeds and five spice). Then we pour over our beautifully thick salad dressing made of plum sauce, honey, lime juice, chilli, sesame oil and a little bit of kaffir lime. 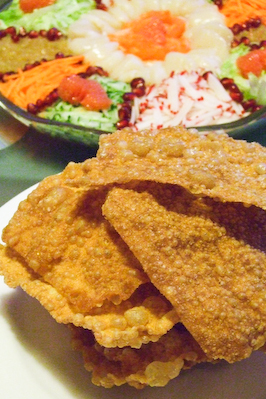 Deep fried wonton skins (expertly fried by A) are scrunched up and sprinkled over the top. ...And tosses like crazy! 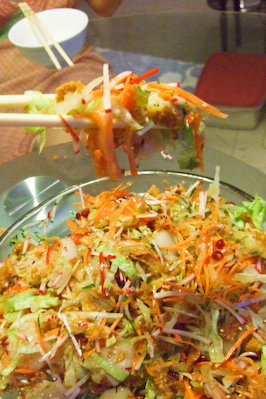 The higher your can lift the salad up with your chopsticks the better, and the messier the better! And finally, you dig in! This was the BEST yee sang we've made so far, the scallops were so fresh and sweet and were still so fat even though we had sliced them in half. 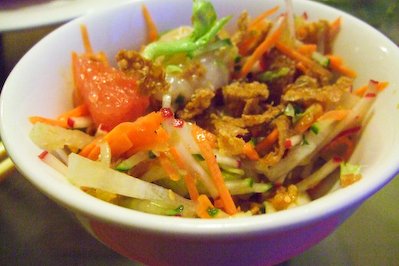 The dressing was sweet and zingy, and there was a perfect balance of textures and flavours. Heaven. 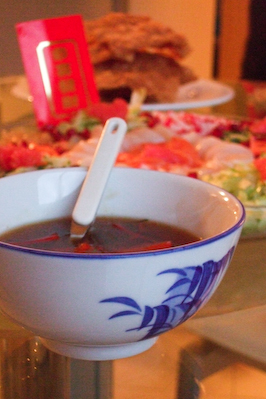 And if that wasn't enough for you, my brother whipped up two more amazing dishes for us to enjoy. 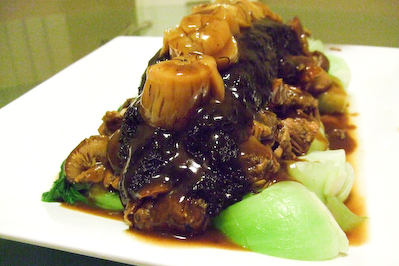 The first was the most delicious thing ever, braised pork with chinese mushrooms, dried scallops and 'hair algae'. Don't be put off by the sound of the algae, it has a beautiful slippery texture and soaks up all the rich sauce. 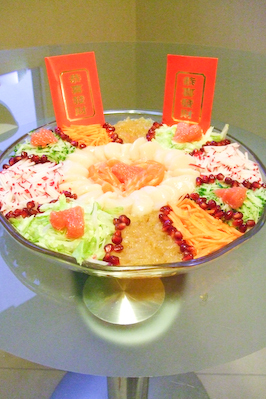 This was an adaptation of a dried oyster and hair algae dish which is quite common during New Years, because when you say dried oyster and hair algae (pronounced 'fat choy') in Cantonese it sounds similar to the Chinese New Year greeting of either "Good deeds and prosperity", or "Good business and prosperity". 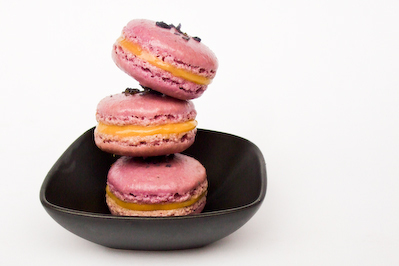 And it's like an explosion of umami on a plate. Soooooo goooooood. 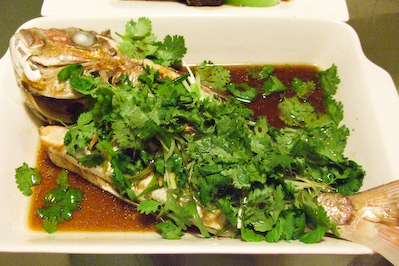 We also enjoyed a whole steamed snapper, and a dessert which will have to remain a secret for now. Needless to say, we had WAYYY too much food and didn't finish anything except for our yee sang. I hope everyone else is enjoying the festivities today, and have a very happy New Year!